I’ve recently installed a new application but this seems to have stopped my Windows computer from booting. What can I do? Why cant I use KMS activation to activate Windows 7 on my Samsung laptop purchased with Windows 8? Why is my Windows 7 System giving me a Secure Boot Violation Error Message? Windows Pre-Installation Environment - PE - command prompt. This command prompt has administrative rights by default and a greater level of hardware access is possible due to the minimal Windows operating system that is running. However, there are restrictions on the applications and programs that can be run inside PE. Often, the utilities have to directly match the PE environment being used - for example, 64-bit utilities have to be used on a 64-bit PE. Before running any diagnostic utilities or BIOS updates, you need to find out which one of the four command prompt types is required. The commands below will help you to navigate and perform tasks in these situations. Change Directory. Thie will take you between folders. CD <directory name> takes you to that directory. To change to another path, type the full path with slashes. e.g. Displays DOS Help. For help on an individual command, type HELP then the command for which you want more information. HELP DIR displays information on the DIR command. Note: Commands inside the command prompt are almost always not case sensitive, which means that they can be typed lower or uppercase or even a combination. You may experience an error code of 80240020 during the Windows 10 Upgrade process after you've had confirmation that the upgrade is ready to install. Go to C:\Windows\Softwaredistribution\Downloads and move all the files in the Downloads folder to a separate folder on your desktop, or somewhere else temporary. This command should trigger a fresh download of the Windows 10 files into the Softwaredistribution\Downloads directory. Once the files have been successfully downloaded into the directory the upgrade process should start again. The upgrade process goes through the following stages - Copying files -> Install Features and Drivers -> Configuring settings. Once complete the system will reboot into Windows 10. You can then delete the temporary folder you saved earlier. 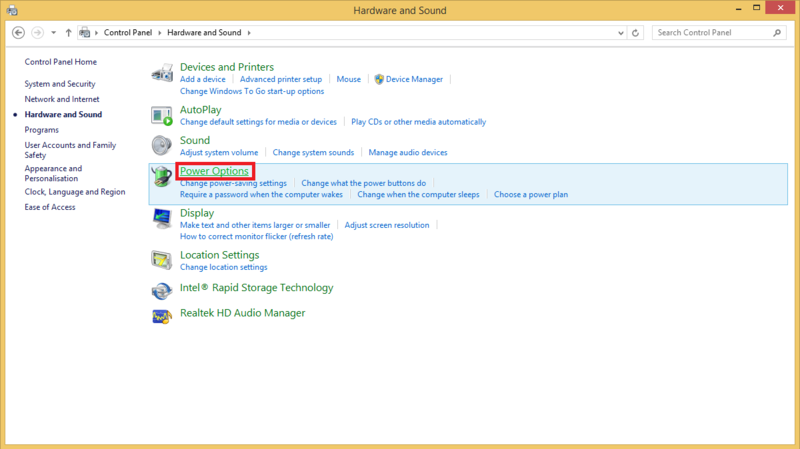 if you attempt to either factory reset or refresh a machine with Windows 8, in some situations you may find that the options are missing, or you may be prompted for installation media. This is a software problem where the recovery storage area is marked as disabled. Normally, installation media should not be required to perform a factory reset or refresh as the files are stored in the recovery area of the hard drive. If the Windows RE Status shows as Disabled, type ReAgentc /enable to enable it. If this reports successfull you should now be able to use the refresh and reset options. Systems running Windows 8.x except those that boot WIM images, such as the Stone Classmate 3. Running the Realtek Audio Device Driver setup program appears to run normally, but then fails with the error code 0x000005b4 after a long delay. Or you attempt to update the driver manually in device manager, using the driver INF file, and this again fails to update or install, again after a long delay. Windows reports that the driver is not installed, or not configured correctly. This problem can occur on low power or low performance systems with large device drivers such as the Realtek Audio driver. Low power systems include those based on Intel Atom processors. High performance systems that can normally install even a large driver in a few moments will not benefit from the resolution below. Windows has a Device Driver installation process timeout value. The long delay or time required to install a large driver on a slow or low energy system means that the system may hit the default or configured device driver timeout value - and then the device driver installation will be automatically aborted. You may receive a message that the timeout has expired and/or you may get an error code of 0x000005b4. Increase the driver installation timeout value, and then re-attempt driver installation. This can be done either by editing the local system policy or by importing a registry file. Expand the menu tree on the left to find the "Configure device installation time-out" setting which is in the "Device Installation" section. To do this, expand "Computer Configuration" on the left hand side, then find and expand "Administrative templates", then "System" and finally left click on "Device Installation". "Configure device installation time-out" will then be available on the right hand side. Double click on "Configure Device Installation time-out" to edit the setting. Click on "Enabled" to enable the setting, and change the Device Installation timeout from the default of 300 seconds to 1800 seconds. Then click on Apply and then OK.
Notice that the setting has now been enabled as below. Finally, try the driver installation again. As an alternative to the method above, import the attached registry file. To do this, download the attachment to this article, and extract the .reg registry settings file. Then double click on it to import the setting. Finally, re-attempt driver installation. Note: We recommend that you disable anti-virus software whilst performing driver updates. This will improve driver installation reliability. Always remember to re-enable your anti-virus software afterwards. All systems running Windows 7 or Windows 8.x, especially low power systems such as those based on Atom processors. This problem and solution has also been seen with Windows 10, again usually restricted to low powered Atom or Celeron systems. Stone PCs and Notebooks come with a built in recovery partition which can be used to recover Windows to the factory defaults. Please Note: This facility is only available if the recovery partition was not removed as part of a customers software deployment process. For example, a customer imaging process that removes all partitions will remove the ability to recover the system back to the factory state. You need to make sure any personal data is backed up to an external device before running the recovery, as using this procedure will erase all user data from the hard drive. If a notebook system is to be recovered, ensure that the AC charger is plugged in. Shut the system down if it is not already off. Turn the system on and when the Stone splash screen appears during the startup process immediately start tapping F8. You will be presented with a screen that says Advanced Boot Options. Make sure Repair your computer is highlighted and select enter. Select the keyboard layout to United Kingdom then select Next. Either enter in your windows username and password, or select the Admin account (if available) and select Next. Click on the Stone Group Ltd factory reset tool. Let the recovery process complete. This will take several minutes. Note: Ensure that all user data, such as documents, settings and favorites are backed up to an external device or location before using the recovery procedure. Occasional problems with imaging tools and processes could lead to a system that will not boot after it has been reimaged. For example, differences in SATA controller, partition sizes or versions of imaging software could leave you with a system where the boot sector is not correct, or the boot configuration database (BCD) needs to be re-written. Typically systems with this problem will not boot the operating system but just display a flashing cursor on the screen after the BIOS POST has completed. Note: These instructions have been written for Windows 7 and do not apply to Windows XP. 1. Create a Windows 7 Recovery CD that matches the imaged operating system (for example 32 bit or 64 bit). 2. Boot the system from the CD. 3. Ensure you press a key when prompted to confirm that you want to boot the system from the CD. Tip: If you cannot create a Windows 7 Recovery CD, then a bootable USB pen drive containing Windows PE will suffice. 4. When the system has finished booting from the CD, select the Command prompt option from the menu. 5. At the command prompt type DISKPART and then press enter. You will get the DISKPART> prompt. 7. DISKPART>select disk 0 and press enter. 8. DISKPART>list partition and press enter. 9. DISKPART>select partition 0 (this should be the partition that the system boots from, normally the small reserved area) and press enter. 10. DISKPART>active and press enter. 11. DISKPART>exit and press enter. 15. Type in bootrec /FixMbr and press enter. 16. Then type bootrec /FixBoot and press enter. 17. Finally, type bootrec /RebuildBCD and press enter. 18. After rebuild has finished reboot the machine. 19. The machine should now boot into windows 7. You may be able to prevent this situatiuon when deploying an Operating System image by using an option in your disk imaging software to completely recreate the partition table and boot sector (effectively erasing the drive), for example by using the DISKPART CLEAN ALL command. Note that this may remove Virtual PC check or other pre-installed tools. All desktop and laptop products running at least Windows 7. You may receive Windows Update Error 0x8024402F even if the system has been reimaged. Any desktop or laptop product running Microsoft Windows 7 or Windows 8. This is caused by a problem with the Microsoft .NET Framework 4 Client Profile. 4. Confirm that you want this component to be uninstalled. This may take a few minutes. 6. When the system has reboot, re-run Windows Update and as normal. More Information: This has been documented on the Microsoft Technet here. All Desktop and Laptop products running Windows 7 or Windows 8. The attached utility will retrieve system hardware WMI / DMI information, such as baseboard (motherboard) information and a list of enabled hardware devices. This utility is useful in building WMI queries or scripts to uniquely identify hardware on a network, such as for SCCM task deployment or driver updates. Download the package attached to the article or here. Logon to the system as an Administrator. Extract the package to a folder. Right-hand click on detect.bat and run it as an Administrator. The file WMIOUTPUT.TXT will be created. This contains the hardware WMI information. If required, please send this file to Stone Support for assistance on determining the best WMI information to use. Note: Sample useful WMI queries include WMIC ComputerSystem GET Model or, preferably, WMI Baseboard GET Product. Stone branded Desktop, Laptop and tablet systems. Please tap the F8 key during the start-up process, from when you turn the machine on. You will be presented with the Windows boot menu. Please then choose the “Last known good configuration” option and this will restore your PCs software registry to the state before you installed the application. Your PC should then start Windows successfully. Note: If the problem only appears after you have booted the system and logged on, the Last known good configuration option may not resolve the issue. All Laptop and Desktop systems running Microsoft Windows. After upgrading to Windows 10 you may find that some device drivers are not installed. For example, the Microsoft Basic Display Driver might be used instead of a proper, fully featured display driver. This would not give the system performance that you would expect. There are several ways to add or provide the missing drivers. Run Windows Update after completing the upgrade, and install all updates including optional updates. Check the Stone Driver finder to see if drivers for Windows 10 are available. Or lastly, check the component vendor's web site for an updated driver, for example http://www.intel.co.uk. All Stone products capable of running Windows 10. 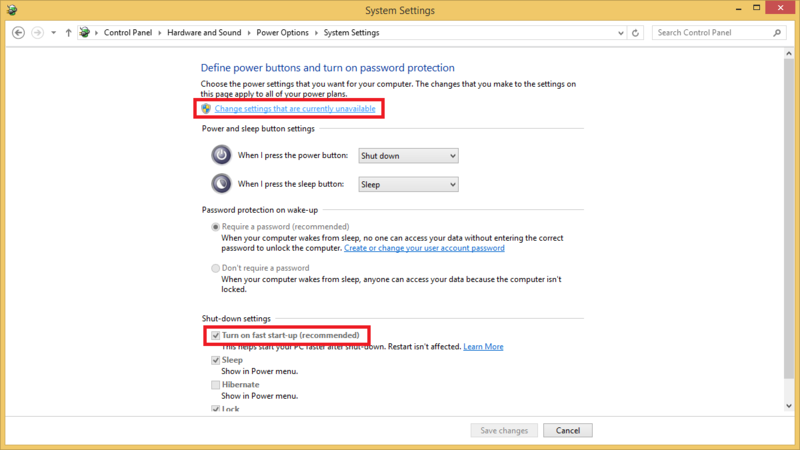 Due to the way in which Windows 8.x handles system and device power states there may be some instances where a desktop or notebook computer cannot be remotely switched on by a "Wake on LAN" (WOL) command. The same model of system can be remotely switched on using WOL if the system is running Windows 7. 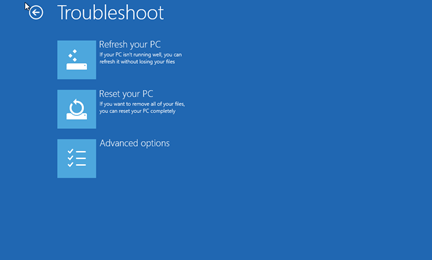 The Windows 8 Fast Boot feature also controls how the system is shutdown. 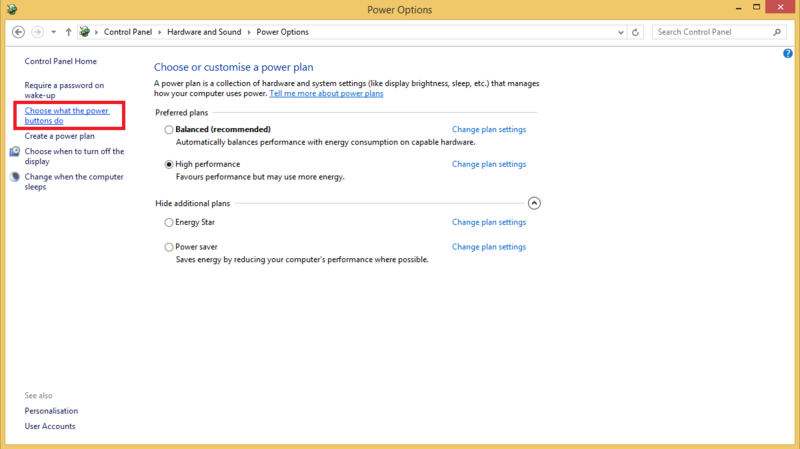 The mode that Windows 8 uses to power down devices can leave the system not able to respond to WOL commands. To resolve this problem, turn off Windows 8 fast boot features. In Control Panel, open the Hardware and Sound item. Then open the Power Options item. Click the Choose what the power buttons do link. Now untick the Turn on fast start-up option. You may need to click on the Change settings that are currently unavailable link first. Once you have completed the above steps click the Save changes button. Systems running Windows 8.x or Windows 10. Windows 7 KMS Product Activation may not work on Samsung laptops purchased with Windows 8 (non-Pro). You may not be able to activate Windows 7 machines using a Key Management Server (KMS) on these models. KMS Activation is a common method of performing Microsoft Product Activation on large numbers of machines (more than 25) in an organisation. This is caused by the Windows 8 BIOS of the Samsung machine not having the necessary SLIC tables for Windows 7 activation. As Windows 8 (non-Pro) does not have any downgrade rights to Windows 7, these SLIC tables have not been included. Windows 7 KMS activation requires that the machine was purchased with an eligible version of Windows. Windows 8 (non-Pro) is not eligible as Windows 8 does not have downgrade rights. Use a Multiple Activation (MAK) key instead of KMS. Please note that you will need to check your licensing agreement for the eligibility and availability of a MAK key for Windows 7 for your organisation. You may need to adjust your software image or image deployment method for the replacement method. Ensure that you are licensed to use this method. Purchase machines that already have a suitable Windows 7 license for you to upgrade to your intended Windows 7 product. If you are running Windows 7 and your system uses an Asus motherboard, you may find that your system starts giving you an error message when you boot up, claiming that there is a "Secure Boot Violation". The cause is a Spring 2016 Windows Update which causes systems that contain Asus motherboards to incorrectly enable Secure Boot. As Secure Boot is not supported by Windows 7, this results in the error message above. Note: If you have not recently installed Windows Updates on your system, or if you are deploying a brand new system for the first time, you may not be affected by this precise issue. However the instructions below on disabling Secure Boot for Windows 7 still apply. The resolution depends on whether or not you have a small number of systems affected, or if you are managing an issue that could potentially affect a large number of systems. 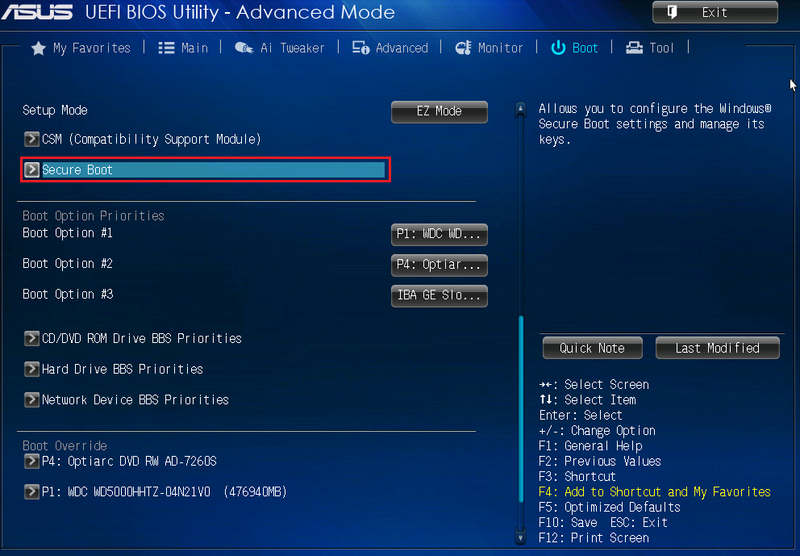 Start the system and go into the BIOS by tapping the F2 or DEL key when the Stone / Asus splash screen appears. Press F7 to go into Advanced Settings. Go to the Boot Menu. Go into the Secure Boot Submenu. 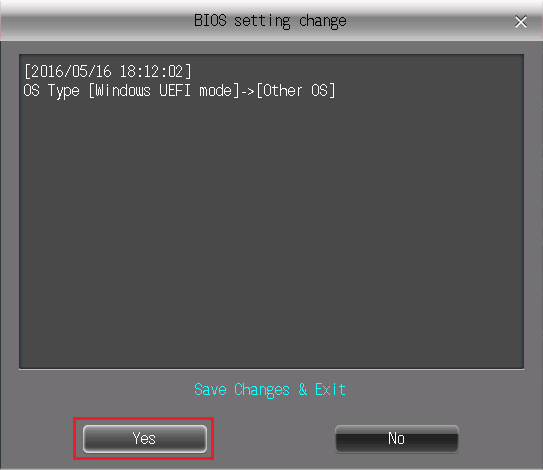 Change the OS type from Windows UEFI Mode to Other OS. 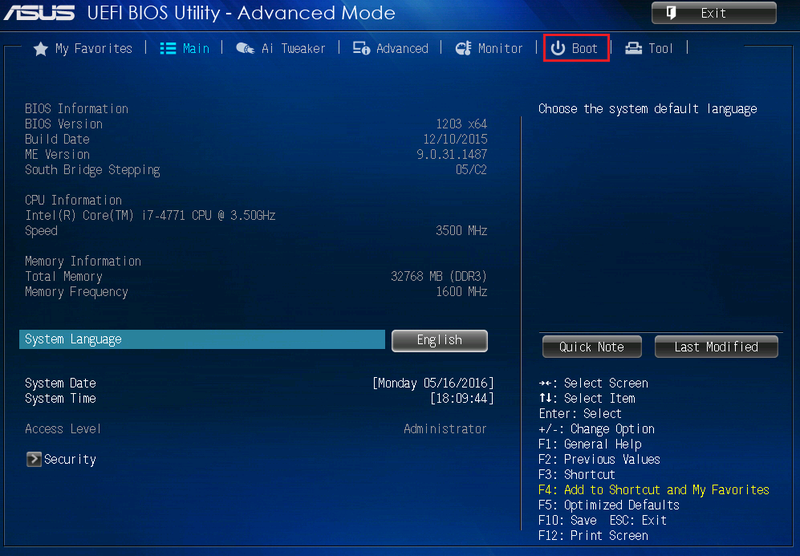 Press F10 Save changes and exit the BIOS. If you need to deploy this update, we recommend you deploy this update in manageable stages so that you can deal with any BIOS settings changes that are required. If you do not use Bitlocker on a machine, or do not use Bitlocker and FIPs, or if the machine is already encrypted, you may not need to deploy this update to that machine. 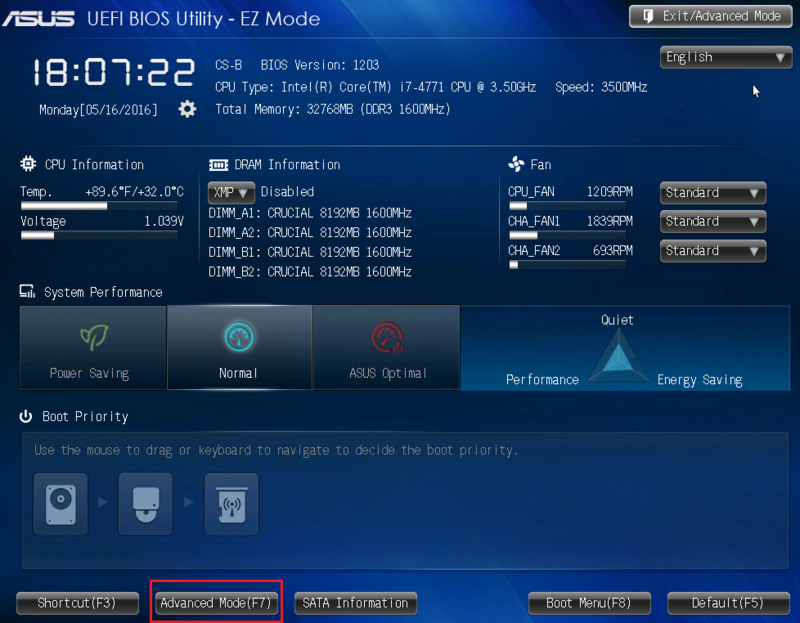 This problem affects many systems based on Asus motherboards that support Secure Boot. The problem is not limited to systems manufactured by Stone Computers. The Microsoft KB article which contains information about this update, and the issues it causes can be found here. An Asus web page which confirms this problem is available here. ​If you are running Windows 8.x1, or Windows 10, you are not affected by this issue, as these operating systems are supported by Secure Boot. Unlike Windows 7, Windows 10 does not include the software support as standard to play movies on DVD discs. If you insert a DVD disc into a Windows 10 machine you likely will not get an Autoplay menu - nothing happens. To get around this problem, you will need to install additional software which provides support for DVD playback. Windows DVD Player is available from the Microsoft App Store. You will need to sign into the App Store to be able to download and install this software. This software is currently free if you upgraded from some versions of Windows 7 or Windows 8, or else it is around £12. This third party software is free and will play DVD disks and some unencrypted Blu-Ray disks. Most Blu-Ray films are encrypted and will not play with VLC Media Player. 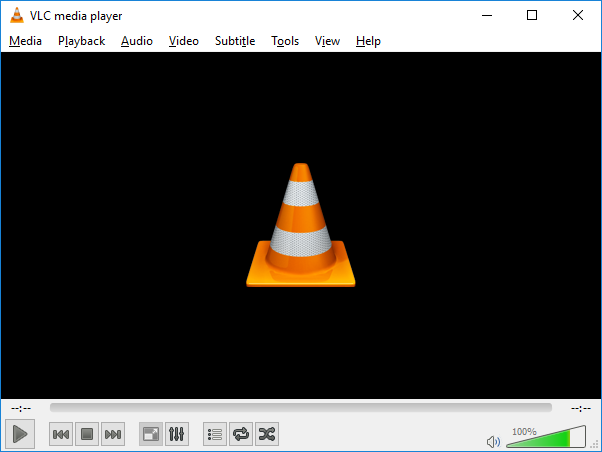 Download the VLC Media Player from http://www.videolan.org/vlc for free. Then when you insert a DVD you will get the Autoplay menu which will give you then option to choose to play the disk with the VLC player. If you require Blu-Ray software capable of playing films and other content, please contact your Stone account manager, for pricing on one of our media suites. A Windows 7 SP1 or Windows 8.1 based machine takes a long time trying to check for available updates. It either never completes, or takes many hours. Such a machine likely has not installed or checked for updates for a significant period of time. This issue is caused by changes to Windows Update servers at Microsoft's end, meaning that updated Windows Update components are required to resolve this problem. Update the required components using the steps below. Stop the Windows Update Service. Install the April 2015 Servicing Stack Update. Stop the Windows Update Service again. Install the July 2016 Update Rollup. Install the July 2016 Servicing Stack Update. Reboot if prompted to do so. Note: The fix for Windows 8.1 x64 also applies to Windows Server 2012 R2. All Stone Products running Windows 7 SP1, Windows 8.1 (with Update) - (all running 32bit - x86 - or 64bit), or Windows Server 2012 R2. 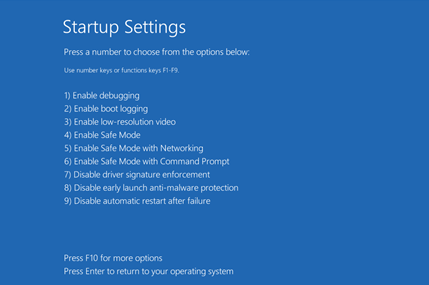 Windows 8 no longer has the option to press F8 when the machine starts to get the advanced boot options menu, meaning that access to safe mode using this method has been removed. This has been implemented to improve boot times. 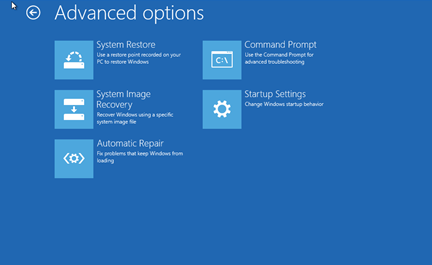 This article shows you how to start a machine in safe mode when Windows wont boot. If you have already started Windows but still need safe mode, use the related articles below for tips. If Windows 8 tries to start up and encounters a critical problem during boot, it will automatically launch the Automatic Repair function. This is the same as the old Start-Up Repair within Windows 7 and Windows Vista. If your machine scans and Automatic Repair starts and does not detect, or is unable to solve the error, it will display the screen below. You will then need to click the Advanced Options button. You will then be presented with the Advanced start up screen. 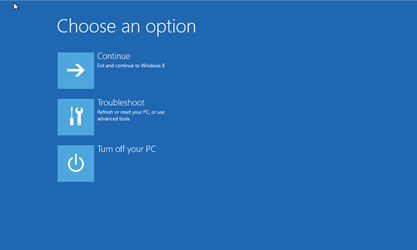 You need to click on Troubleshoot > Advanced Options > Start Up settings > and then Restart. Tip: You may also wish to use option 9/ Disable Automatic Restart after failure, so that any blue-screen message is visible on screen when the system crashes during bootup, rather than the system instantly restarting. This article shows you how to reboot a machine into safe mode if you haven't already logged in. Use the other articles attached to see safe mode options for when Windows doesn't start, or safe mode tips for when you have already logged in. First you need to click past the Lock screen to go to the Log in screen. You then need to click the Power Icon at the bottom right of the screen > hold the SHIFT key down and then click Restart. You will then be presented with the advanced start up screen. You need to click on Troubleshoot > Advanced Options > Start Up settings > Restart. This article shows you how to reboot a machine into safe mode when you are already logged into Windows. Use the other articles attached to see safe mode options for when Windows doesnt start, or safe mode tips for when you haven't already logged in. You can launch Safe mode from within Windows 8 by going to the Start Screen > Opening the Charms bar (press the Windows Key and C together) > Settings > Change PC Settings > ‘General’ heading > scroll to the bottom and under Advanced Startup click Restart Now. You will then be presented with the Choose an option screen. You need to click on Troubleshoot > Advanced Options > Start Up Settings > Restart. Are you having issues with displaying content within Internet Explorer on Windows 8? The Windows 8 style Internet Explorer application from the Start screen does not support add-ons. So if you are trying to play a game or watch a video that requires plug-ins such as Java, then you will need to open Internet Explorer on the desktop and try again. Unlike Windows 7, Windows 8 does not include the software support as standard to play movies on DVD discs. If you insert a DVD disc into a Windows 8 machine you likely will not get an Autoplay menu - nothing happens. One option is the Microsoft Windows Media Center. 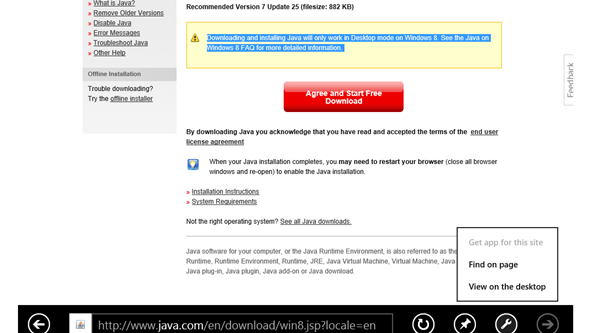 This is not a free option - you will need to purchase and download it from Microsoft. This includes TV recording capabilities and DVD playback etc. There are some third party alternatives to Windows Media Center. Some of them are without charge - for example you can download the VLC Media Player from http://www.videolan.org/vlc for free. Then when you insert a DVD you will get the Autoplay menu which will give you then option to choose to play the disk with the VLC player. There are some new features that are available to use within Windows 8 if you are having system problems. Some of the options from previous versions of Windows are also still available. 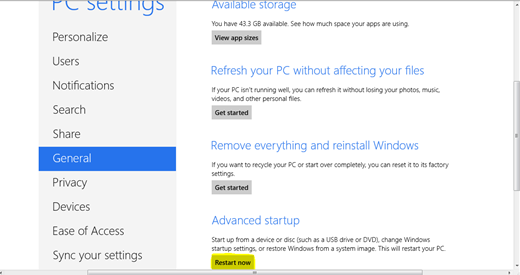 If Windows won't start and you need to perform recovery, see this section. To access the new feature, you first need to go to the Start Screen and then Open the Charms Bar (by hovering over the top or bottom right of the screen or pressing the Windows Key and C at the same time), then click on the Settings option > click Change PC Settings > click the General Tab (as below). This will do a reset of Windows 8 whilst keeping your user files and personalized settings; it will reset PC settings back to their defaults, Apps from the App Store will be kept, but third party apps from installation disk or downloaded from the internet will be removed. Note that a HTML document will be available on the desktop with a list of all the installed applications from the internet and installation media that was removed from the computer during the Refresh including a link to the site for re-download. This will perform a complete reinstallation of Windows 8 - everything will be removed. It essential that you back up your data first before using this option as the system will be completey restored to default. Then click on Troubleshoot, which will display the page below. If you click Advanced options, you will get the options below. System Restore – this will launch the system restore options so you can restore your system back to a previous state. This does not affect user data. System Image Recovery – this will do a complete Image restore (if you have previously created a recovery image). This will remove user data. Command Prompt – this will open a command prompt based system recovery console for you to solve specific issues. Automatic Repair – this is used to automatically detect and solve any start up issues. How Do I Recover Windows 8 if the System Won't Boot? 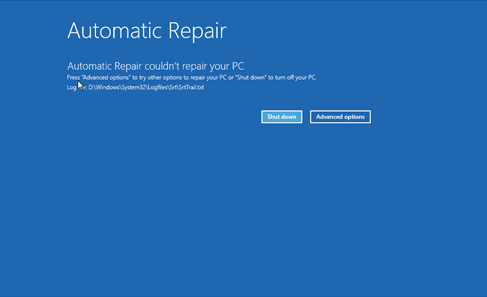 To recover Windows 8 when it won't start, the system will first start Automatic Repair. After following Automatic repair, if this is unsuccessful - i.e. it reports that it couldnt repair your PC, you will have the the ability to click Advanced Options. 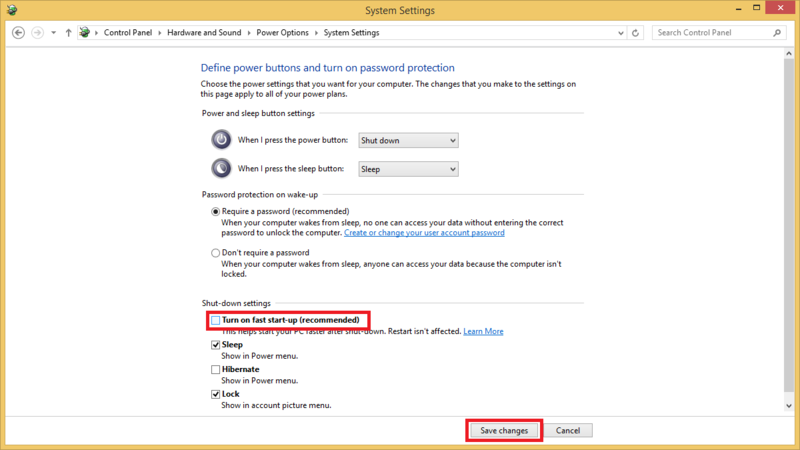 Then click on Reset your PC to completely reset Windows, or Refresh to attempt to leave user data in place. You are trying to activate Windows in a location that uses a strict internet filter and a proxy server. Windows Activation does not work as it cannot reach the activation server. Windows Activation does not use your web browser settings to look to see if a proxy server needs to be used to gain internet access. If your location does not allow internet access without using the Proxy server, access to the Windows Activation servers may not work, as above. You can resolve this issue by configuring the Windows HTTP component from an Administrative Command prompt. 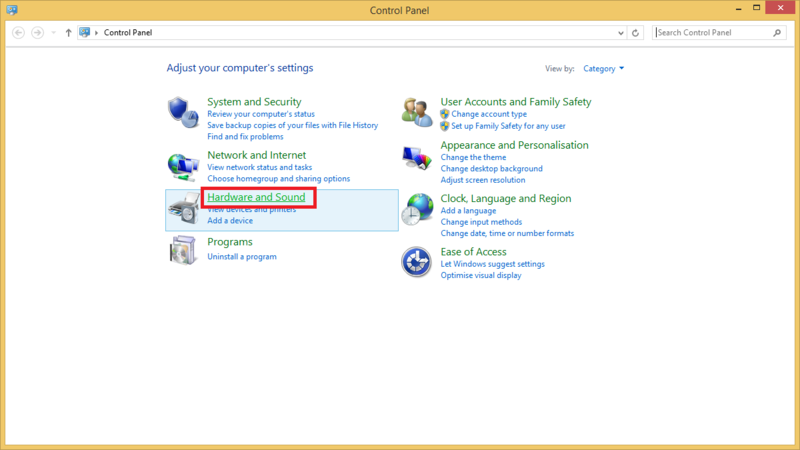 Make sure you have configured your Proxy settings in Internet Explorer or Edge and that you can access external web pages. Type in the command below, substituting your proxy server address and port. netsh winhttp set proxy <proxyserver:port> ""
The double quotation marks tell the system to bypass the proxy for local addresses. This example shows a system that has not had WinHTTP configured to use a proxy. Note: If you have lots of systems to activate in this way, and if you have a volume license agreement, considering using a Key Management Server (KMS) or Active Directory activation. If you would like us to help you configure this, contact your Stone Account Manager for details of our professional services. This can be caused by a configuration setting that may have been set by accident, or by malicious software. As a troubleshooting step, go to the System Configuration Utility (msconfig) and check that Safeboot is not selected (checked). You can find this on the Boot tab, under Boot Options - ensure the box is not checked for Safeboot. 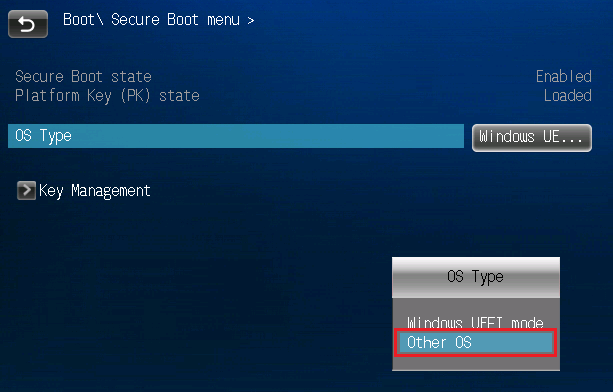 If you discover that Safeboot is checked, then simply uncheck it, click OK and then restart the system. All systems running Windows XP or higher. You have an Intel Kaby Lake based system (the 7th generation Intel Core products, such as the Core i5-7500). You are running Windows 7, Windows 8.1 or Windows Server 2012 R2 and attempting to install updates through Windows Update. Windows Update Fails with the error code of 80240037. 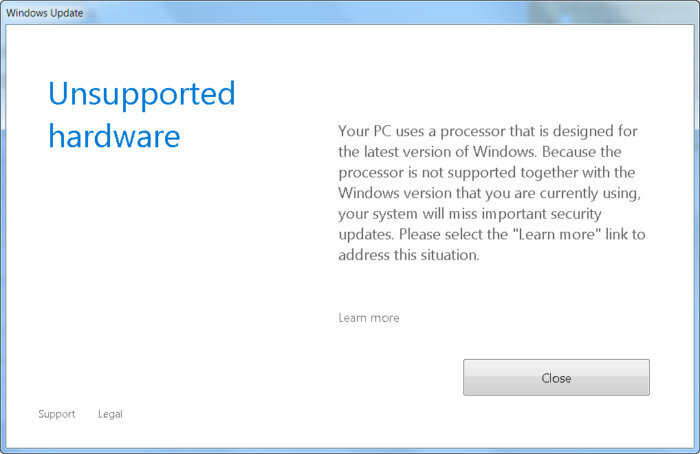 Additionally, a message appears telling you that you have "Unsupported hardware". Each new generation of processor requires both driver support from component manufacturers and often, platform support from Microsoft. As Windows 7 is now around 8 years old, as of 2017, Microsoft have decided not to add Kaby Lake support into Windows 7. Support is also not available for Windows 8.1 or Windows Server 2012 R2. Note: With the Windows Update engine effectively disabled by the "March 2017 Preview of Monthly Quality Rollup" (Windows 7 - KB4012218 and Windows 8.1 - KB4012219), on detection of a Kaby Lake processor, your system is now exposed to future security issues or vulnerabilities. "Because of how this support policy is implemented, Windows 8.1 and Windows 7 devices that have a seventh generation or a later generation processor may no longer be able to scan or download updates through Windows Update or Microsoft Update." We recommend that customers upgrade to Windows 10 as soon as possible. If you need transition assistance from Stone, please contact your account manager. Downgrade your system to a Skylake (6th generation) processor. Most Kaby Lake motherboards are capable of taking a Skylake processor. Install Windows 10, and then run Windows 7 or Windows 8.1 as a virtual machine (VM) to support your application. Windows 10 Enterprise, Professional or Education already includes Hyper-V, the Microsoft tool used to create virtual machines. Stone Desktops, NUCs and Notebooks based on the Intel Kaby Lake platform, running Windows 7, Windows 8.1 or Windows Server 2012 R2.